This news item was posted in Politics category and has 0 Comments so far . Muttahida Qaumi Movement (MQM) Chief Altaf Hussain underscored the need to form a technocrat government for a period of at least two years that should carry out an across-the-board and ruthless accountability. Addressing a press conference after the meeting along with Punjab Governor Chaudhry Muhammed Sarwar, he said Pakistan needs none of the robbers and those who practice hereditary politics; instead, Pakistan needs honest people like Chaudhry Sarwar. The MQM chief said the issue of Islamabad sit-ins is related with the entire country, as women and children are sitting in the open for so many days now. The Punjab governor urged on the political parties to come forward to help IDPs from North Waziristan Agency and flood-displaced people, adding the most of today’s discussion was devoted to IDPs and flood-affected people. Chaudhry Sarwar remarked that all parties are in agreement over the electoral reforms, adding the national problems cannot be resolved with the resignation of Prime Minister Nawaz Sharif. Instead, the national institutions will have to be strengthened for the resolution of the issues, he added. 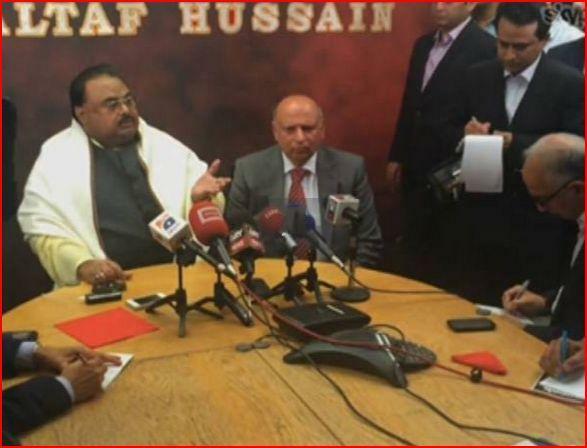 Altaf Hussain pleaded with the two sides to offer face-saving to each others. Reiterating his demands for formation of new provinces, the Muttahida chief asserted more number of provinces are symbol of progress and discipline in the country.